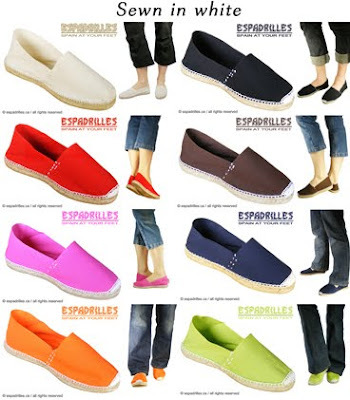 Welcome to THE ESPADRILLES, the first website entirely dedicated to the famous Spanish espadrilles! The espadrille (alpargatas) is a shoe from the Basque country (Spain), made of cotton or linen fabric with a flexible jute rope sole. This authentic Spanish product has been handcrafted for many generations in several small villages and has, therefore, a very long history associated with it. Entirely handmade, the espadrille symbolizes an ecological, easy going and dynamic lifestyle. Our Spanish espadrilles are designed for HER as well as for HIM. They are made for people who like practical and comfortable shoes, and who care for the environment. Fabrics are natural, soft and top quality and are available in a great choice of colors. Jute, a 100% natural fiber, is used in the making of modern espadrille soles. Woven jute is very popular because of its eco-friendliness compared to synthetic substances. If you are looking to purchase a pair of espadrilles for yourself, have a look at the 'choose your espadrilles' section of our website, it will link you to our espadrilles store website. If you have a shop and would like to carry this unique brand of shoes, contact us in order to activate your wholesale account. 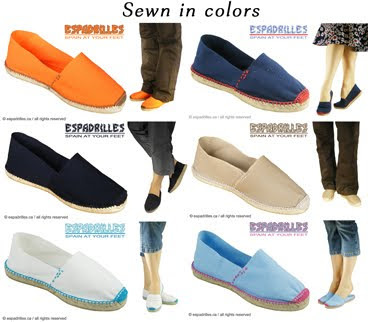 The espadrilles team is entirely at your disposal for any questions you might have. Copyright © 2017 Diegos® theespadrilles.com All rights reserved.